Verosol Australia Pty Ltd (Verosol) has a long tradition of manufacturing premium quality window furnishing across Australia and around the world. This warranty covers the repair or replacement of any defective material or component in Verosol’s Blinds and Shutters. Verosol provides a manufacturer’s warranty that your Verosol Blinds and Shutters will be free from defects in material and workmanship for a maximum of five (5) years from the date of Verosol invoice. Our products come with guarantees that cannot be excluded under the Australian Consumer Law. You are also entitled to have the product repaired or replaced if the product is defective. This warranty is valid when payment for the Verosol Blind or Shutter has been paid in full and proof of purchase is provided to Verosol. This warranty supersedes all previous and existing materials relating to warranties published by Verosol. All installation, return and ancillary costs are the sole responsibility of the Verosol Distributor / Specialist Dealer. exposure to the elements (sun damage, wind or rain), discolouration over time. Claims made against transit damage, short supply or visible defects to the products, must be reported within forty eight (48) hours of receipt of goods, and be accompanied by photographic evidence for assessment by Verosol. Calling Verosol Customer Care 1800 011 176 for warranty assistance. ^ Back to base warranty requires that goods are returned to Verosol’s manufacturing facility located in Revesby, NSW 2212. * Please retain your proof of purchase in the event you need to register a service call. 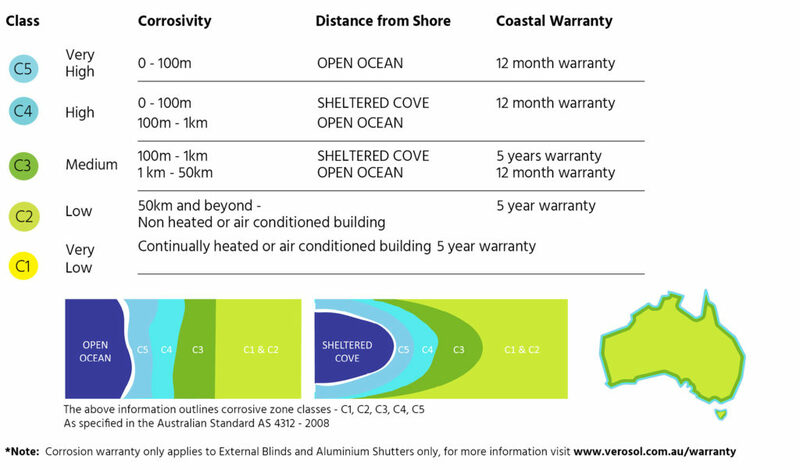 Use not in accordance with the care and maintenance and operating instructions, and the warranty videos published on the Verosol website (verosol.com.au) are not covered by the Verosol Warranty. The Verosol 5 year limited warranty applies to products purchased on or after the 1st January, 2009. Large width roller blinds larger than 2400mm and/or longer than 3000mm, could show the effect of “V’ing. This effect is predominant on all large blinds. To reduce this effect, consider splitting the blind into smaller widths and/or multi-linking blinds together. Textured or directional fabrics may not have the warp (vertical) or weft (horizontal) yarns travelling perfectly perpendicular to each other. Some deviation from the pattern or texture will exist. You should expect to see variations of up to 30mm in the direction of the pattern from one side of the blind to the other. Selected Verosol fabrics can be railroaded. Railroading fabric often leads to curling or cupping of the outer edges of the blind. Railroading of the fabric changes the appearance of the blind, which is more pronounced in textured fabrics. Cupping of fabric at the outer edges of the blind is more pronounced on wider width roller blinds. Please refer to the Verosol pricelist for specific details of non-rail-roadable fabrics. All roller blinds allow light to pass around the sides of the fabric (even when blockout fabric is used). This is because the overall width of the blind including it’s brackets is always wider than the fabric width. Light Gaps are most prominent when a blind is fitted inside a window recess. Face fitting may be a better option than reveal fitting, however, the only way that light gaps can truly be minimised is to use hardware systems that utilise side channels. Some roller blind sizes may require fabric to be joined. Depending on the fabric and type of join used, this may result in either visible pinholes through the join, or a solid band across the width of the join. Please refer to the Verosol pricelist for specific details of fabric joins. Some wider width roller blinds will exhibit a deviation across the width of the fabric at the base rail. This can be minimised via selection of base rail options. Please refer to the Verosol price list for available base rail options. Corrosivity Categories as specified in the Australian Standard AS 4312 – 2008 has been used to calculate our warranty limits.